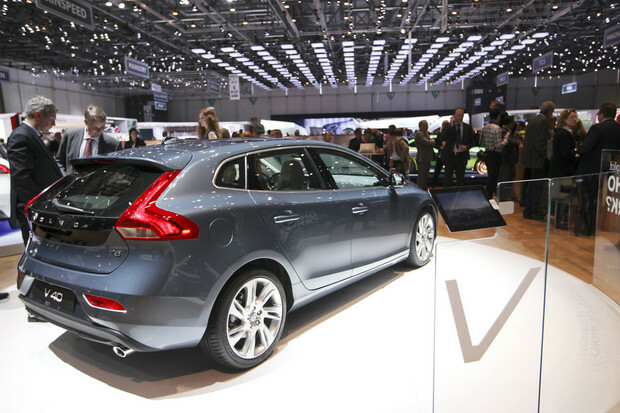 A Volvo V40 automobile, owned by Zhejiang Geely Holding Group Co., is seen on display on the second press day of the Geneva International Motor Show in Geneva. Volvo Car Corp. (175) showed a five-door hatchback this week in Geneva featuring the world’s first pedestrian air bag. The Swedish carmaker is counting on such innovations to burnish its safety image and help double sales. The V40, Volvo's first model designed under owner Zhejiang Geely Holding Group Co (GEELZ). of China, has an air bag that ejects from the hood to protect pedestrians from injury. It also has a backswept headlight and panoramic glass roof to give it a sporty look. Volvo is targeting the hatchback at potential buyers of Bayerische Motoren Werke AG (BMW)'s 1-series, Audi AG's A3 and Daimler AG (DAI)'s Mercedes-Benz A-Class as the carmaker tries to push into the premium market. Volvo will need to fill other gaps in its product lineup and replace aging vehicles to meet a target of lifting annual volume to 800,000 by 2020. Old models and holes in Volvo’s product portfolio highlight the high development costs in the auto industry and the difficult choices facing an automaker that is not part of a larger group. Volvo sold 449,255 cars last year. That compares with 1.3 million at Audi, itself a unit of Volkswagen AG (VOW), which delivered 8.27 million vehicles across all its brands. Volvo, which will start building the car in May, targets annual sales of 90,000, mainly in Europe, where demand is strongest for small cars in large urban areas. The model won’t be sold in the U.S.
Volvo dealers are hoping for a vehicle at the other end of the spectrum for American buyers: a big, luxurious sedan that can challenge BMW’s 7-series, Audi (VOW3)’s A8 and Mercedes S-Class. Gothenburg-based Volvo is also missing a subcompact car and facing a growing need to replace aging vehicles. The XC90, its largest crossover, will be 12 years old when it’s renewed in 2014. The S80, its biggest sedan, will be nine years old when it’s revamped in 2015. The S40 and V50, Volvo’s smallest sedan and station wagon, are both eight years old, and the company has yet to announce when they will be replaced. Volvo last year pulled them from the U.S. market because of poor sales. The average lifespan for models in Europe is about seven years, according to Michael Tyndall, an auto analyst at Barclays Bank in London. “We have not made a decision on whether to go further up and down” in the various car segments, Chief Executive Officer Stefan Jacoby told reporters March 6 at the Geneva auto show. Volvo intends to focus in the coming years on “core” cars, such as the midsize S60 sedan and crossover XC60, its two bestsellers, he said. Volvo is talking with other carmakers about sharing development costs for future compact cars, Jacoby said, declining to identify the candidates. In China, Volvo’s fastest-growing market, the Swedish company needs more cars with an extended wheelbase to appeal to the chauffeur-driven market, said Bill Russo, a Beijing-based senior adviser at Booz & Co. Mercedes, BMW and Audi all offer models with extended wheelbases in the market. “If Volvo will significantly grow its business, its next stage of development has to be to bring a higher level of localized cars to this market, and I think that’s where they’re headed,” Russo said. Volvo makes the longer S80L model for China at a factory co-owned by former owner Ford Motor Co. (F) and Chongqing Changan Automobile Co. The Swedish carmaker aims to open its own plant in Chengdu in late 2013, and plans a second factory in Daqing. The Chinese government must still approve the assembly. In the U.S., Volvo’s largest market, the company needs more fuel-efficient cars, which are becoming increasingly important amid high gasoline prices, said Jesse Toprak, vice president of industry trends at TrueCar.com in Santa Monica, California, which tracks sales and price trends. Volvo should also consider bringing diesel cars, which have “contributed greatly” to VW’s growth, to the U.S., Toprak said. Geely bought Volvo Cars from Ford for $1.8 billion two years ago in the biggest overseas acquisition by a Chinese automaker. Ford sold Volvo as part of a broader strategy of exiting European lines, after selling Aston Martin, Jaguar and Land Rover to focus on its American brands. Geely later lured Jacoby, who at the time headed VW’s U.S. operations, to take over as CEO. Volvo’s sales peaked in 2007 at around 460,000 vehicles before plunging during the financial crisis and global recession that followed. Pullen, the dealer near Atlanta, said Volvo’s design has improved under Geely and new products are being developed faster than under Ford. “I think they’re doing a lot of the right things,” he said. Workers assemble cars at Geely Auto's factory in Ningbo, Zhejiang province. Beijing has ordered government departments to buy local cars. The European Union Chamber of Commerce in China dismissed suggestions that it would mobilise retaliation against Beijing’s proposal to exclude foreign carmakers from a public fleet procurement programme expected to be worth 12 billion yuan (HK$14.7 billion) a year. The chamber, which represents European carmakers in China, said yesterday that while such a move is “discriminatory” to its members - which include Volkswagen - the last thing they want is a war between countries that hurts development of the car industry. The tensions follow the issuance of a procurement list by China’s Ministry of Industry and Information Technology on February 24, which proposed 412 domestic brands made by 25 carmakers from which officials could buy vehicles. Former favourite brands for officials such as Audi, Honda and Toyota were all excluded, ostensibly due to a new rule that requires a government fleet supplier to spend no less than 3 per cent of its revenue on research and development. The comment was considered a threat to Chinese carmakers’ expansion in Europe. Great Wall Motor recently opened the first Chinese car plant in Bulgaria, and Zhejiang Geely planned to set up a car sales network in Italy. 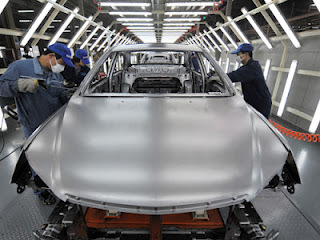 The Chinese government took carmaking off the “encouraged” foreign direct investment list months ago, as Premier Wen Jiabao pledged to control growth of the country’s car manufacturing capacity amid slowing demand. The change was considered a major setback for luxurious carmakers such as Jaguar Land Rover, which was said to be seeking approval to form a 17.5 billion yuan car venture with Chery Automobile. In a statement yesterday, the chamber said China’s latest restrictions on public fleet supplies contradicted a policy introduced just six months ago that included both foreign and local car brands for officials. It urged Beijing to revise its procurement list. However, Bill Russo, senior advisor at consulting firm Booz & Co and former head of Chrysler’s business unit in China, said it was not uncommon for national governments to prefer domestic car brands in the procurement of government vehicles. He doubted the European Union could retaliate in any way. “It was an internal procurement policy,” Russo said. Russo said the move was actually good for foreign carmakers like Audi to focus more of its resources and energy on China’s lucrative retail sector. Audi said earlier the new restriction would hurt less than 5 per cent of its sales this year. SOFIA, Bulgaria — There was an unusual display outside the city's National Palace of Culture recently: a brand-new silver SUV, encased in a glass box and stamped with the words "Made in Lovech" — Bulgaria. The Great Wall Hover was one of the first cars to roll off the assembly line at a new plant built by Great Wall Motors, one of China's major car manufacturers, in association with the Bulgarian firm Litex. 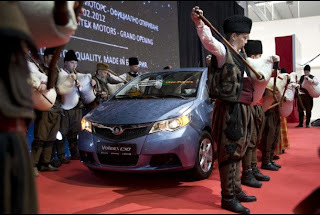 A celebration was held last week for the opening of the assembly plant about 90 miles east of Sofia. This is China's first major foray into car manufacturing in Europe. If Great Wall Motors succeeds, it will gain a much-coveted foothold in the European market. Chinese auto manufacturers have been trying for the last several years to break into the European market. As the debt crisis pushes the euro zone into recession, Chinese auto manufacturers see an opportunity to market their relatively inexpensive vehicles. Other Chinese companies in the past have failed to meet stringent European safety standards. Great Wall Motors is the first Chinese auto manufacturer to have passed the European NCAP safety test, according to Bill Russo, a China auto-industry expert and former executive for Chrysler's North East Asia division. By assembling cars in the poorest EU countries, Great Wall Motors can ensure a ready and cheap labor supply while avoiding EU import taxes for its cars. The new plant is located in an industrial zone outside the tumbledown village of Bahovitsa, population 1,100, where ordinary traffic consists of elderly pedestrians out to tend to their chickens, children riding bicycles and locals driving Soviet-era Lada automobiles. “Probably a lot of people were doubting in such a place there could be such a company, the only factory of its kind in Bulgaria,” said Iliya Terziev, the executive director of Litex Motors. This year, the plant will roll out only 2,000 cars. But Terziev said that he hopes the plant will be able to produce 50,000 cars annually when it’s running at full capacity in the next three or four years. Great Wall Motors in cooperation with Litex will assemble three models in Bulgaria, beginning with a Voleex C-10, a small, five-door hatchback that will sell for about $11,000. The following year, Great Wall will also begin distributing two other models: a pickup truck called Steed and the Hover SUV at $20,000 — about $6,500 cheaper than popular SUVs like the Japanese Suburu Forester. Inside the spacious and airy plant, groups of young men buzz around brightly colored vehicle shells, installing windshields, seats, engines and axels to pre-made exteriors. Great Wall has so far hired 120 workers, and expects to hire up to 2,000 more as production ramps up. Atanas Novakov, 26, a recent graduate from Sofia Technical University, was hired last year and has worked his way up to team leader. Brain-drain has plagued Bulgaria for the last decade, due to the fact that there aren’t many good jobs in Bulgaria for college graduates. “This is a great opportunity for guys like me, and very special for Bulgaria,” he said. Launching an overseas operation in the midst of the European economic crisis is a risk. In order to win, Great Wall will have to undercut competitors on price, Russo said. The Voleex C-10 will be priced a few thousand dollars less than the similarly styled Toyota Yaris. Great Wall has also cleared another competitive hurdle for Chinese car manufacturers. Because it can cost about a billion dollars design a car, many Chinese manufacturers started out copying models from rival companies. Early on, some of Great Wall’s models have looked very similar to competitor’s vehicles, most notably in the 2006 case of Great Wall’s Peri, which Fiat accused of being a copy of its own Panda. An Italian court subsequently banned the Peri from being imported to Italy. Great Wall now exports only models of unique design, which it has been doing successfully in many countries, notably Italy, Australia and the Ukraine, with help from an Italian design firm. Meanwhile, in Bahovitsa, Kalin Krastev, the young, recently elected mayor, said that residents have generally responded positively to the plant. But they will be more receptive, Krastev said, when more jobs become available.